East Passyunk Avenue Business Improvement District (EPABID) is revving up for the 13th Annual Car Show and Street Festival on Sunday, July 29, 2018, from 11:00am to 4:00pm, on EPA between Broad and Dickinson streets. Look for nearly 175+ muscle, classic, antique, custom and show cars, trucks and motorcycles will line the Avenue, with street vendors, rack sales, kids’ activities, live music and the Bang! Boom! CRAFT! Show in between. Wine and dine among the cars as award-winning restaurants and food trucks serve specially priced street food and summertime drinks. Admission is FREE for attendees and $20 for cars. Check-in for cars is moved up this year to 8:00am to 11:00am. The event’s rain date is Sunday, August 5, 2018. For information, visit www.visiteastpassyunk.com, tweet at @epassyunkave and follow #passyunkcarshow. Grab some street grub and summer drinks from visiting food trucks, plus look for $5 deals at many of East Passyunk‘s award-winning restaurants! Look for the balloons to find places offering the $5 specials. The full restaurant and food truck list will be announced in the summer. Past participants have included Bing Bing Dim Sum, P’unk Burger, El Sarape, Fuel, Mamma Maria, Manatawny Still Works, Noord, Pistola’s Del Sur, Plenty Cafe, POPE, Barcelona Wine Bar, Townsend and Vin Cafe. Redcrest Fried Chicken has already signed up early and will make its debut. Look for other new names to debut at the car show in 2018. Live music will keep things moving and grooving as diners enjoy the cars and food selections. All music is outdoors unless otherwise noted. Music will span the generations with the oldies, current hits, rnb, jazz and much more. Look for music in the 1600 block parking lot, at EPA and Juniper, outside Stogie Joe’s, at the Singing Fountain, at the Gateway, and other spots to be announced. The Bang! Boom! CRAFT! Show at the Fountain will again be curated by Nice Things Handmade! Look for handmade items from local crafters and artists, including art, decor, ceramics, jewelry, clothing and gifts from dozens of vendors. Family activities and other fun will offer something to appeal to all ages, including the return of the free bounce castle, plus free and discounted family fun, art projects, music and more. 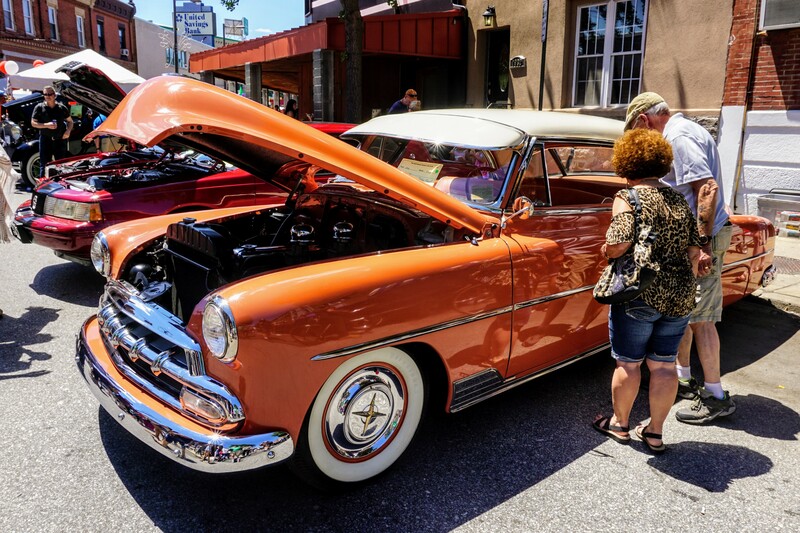 The 13th Annual Car Show and Street Festival is hosted by the Northeast Muscle Car Club and presented by East Passyunk Avenue Business Improvement District. The event is free to attend and $20 for cars. Parking for the Car Show is located at Parkway at Constitution Health Plaza at 1485 McKean (between Broad and 15th street). It is open 24 hours and is only a four minute walk from the parking lot to the Gateway and the start of the car show. For information, visit www.visiteastpassyunk.com, tweet at @epassyunkave and follow #passyunkcarshow. East Passyunk Avenue Business Improvement District is home to 150+ independently owned shops and markets that perfectly balances the best of the old and the new, mixing old world shopping, authentic Italian restaurants, world famous cheese steaks, with trendy boutiques, handmade arts, world-class cuisine and record-breaking events. Chef-driven restaurants have pushed this once-faded community into the national spotlight. East Passyunk Avenue boasts more than 40 eateries, from authentic traditional Italian restaurants to gastropubs, including twelve of Philadelphia magazine’s Top 50 Restaurants. Capogiro Gelato Artisans scoops up National Geographic’s “best ice cream in the world” just down the block from cheese steak global headquarters, where Pat’s and Geno’s still vie to be called the best of this Philly staple. Anchored by the beautifully restored Singing Fountain, a communal gathering place on Tasker Street, this store-lined commercial corridor hosts events of all shapes and sizes. Annual outdoor favorites include foodie-festival Flavors of the Avenue, the Car Show & Street Festival, Farmers’ Markets and East PassyunkCraft Beer Day. For more information and directions, like East Passyunk Avenue on Facebook, follow @epassyunkave on Twitter, pin East Passyunk Avenue on Pinterest or visit www.visiteastpassyunk.com.